Home » traditional food » Farm eggs! 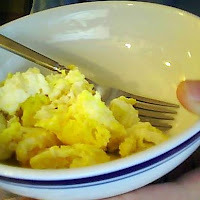 I found a supplier of yummy fresh eggs, from chickens that are pastured and fed non-GMO feed. We're going to meet down the road weekly when she's in town doing errands and I'll pick up 3 dozen eggs. Easy and beneficial for both of us. The eggs are so yummy! Nice and yellow, and they taste better. I grew up having fresh eggs, then we had them when we used to live in the country a while ago, and it's nice to have them again. What is 'pastured'? It just means that the chickens are allowed to roam outside on 'pasture' and do the normal hunting-for-bugs things that chickens do. They're exposed to fresh air, healthy microorganisms in the soil, grass, and bugs in a more natural habitat than cages stacked indoors in a factory 'farm'. 0 Response to "Farm eggs!"